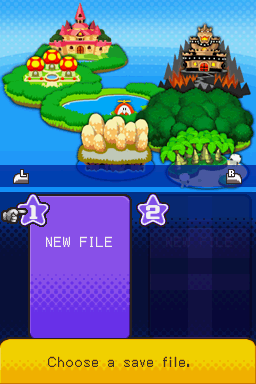 Seen on most menu screens, the L and R button icons were changed to look more like the actual L and R buttons on the DS. Here you can also see that new files are labeled "No data" in the Japanese version and "New file" in the U.S. version. 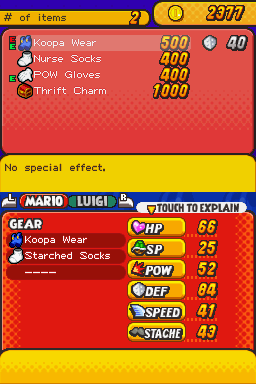 At the start of the game, we learn that a mysterious disease called "The Blorbs" is sweeping across the Mushroom Kingdom. 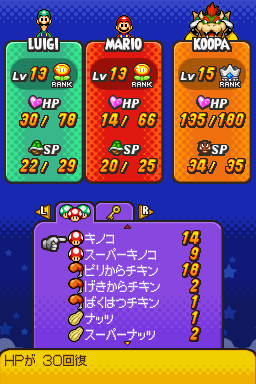 Unlucky Toads afflicted with The Blorbs "balloon to blimp size" and roll away. In the Japanese version, the condition is known as "Metakoro disease," from metabo (metabolic syndrome) and korokoro (rolling). 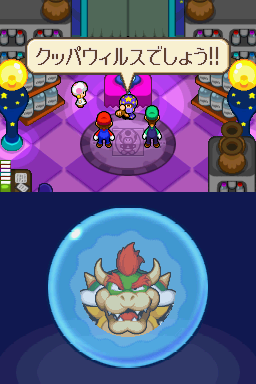 Dr. Toadley diagnoses the bros. with "Koopa Virus" (Bowser Virus) in the Japanese version and "Bowseritis" in the U.S. version. 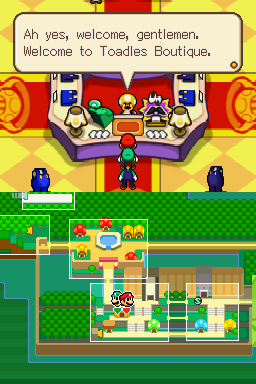 The name of Toad Town's gear shop for Shine ranks was changed from "Kinoda Boutique" to "Toadles Boutique." Blubble Lake: "Zutsūda" comes from zutsū (headache). Bumpsy Plains: "Otapuku" is from otafuku kaze (mumps). Cavi Cape: "Gepū" is derived from geppu (a burp). Dimble Wood: "Ekubon" is from ekubo (dimple). Lumbar Nook: Tsubo means "acupuncture point." Plack Beach: "Mushiiba" is derived from mushiba (cavity). Tower of Yikk: "Ibikki" comes from ibiki (snore). チョロプー兄弟 Choropū Kyōdai Choropū Brothers Monty Bros.
Princess Lipid: Nenmaku means "mucous membranes." 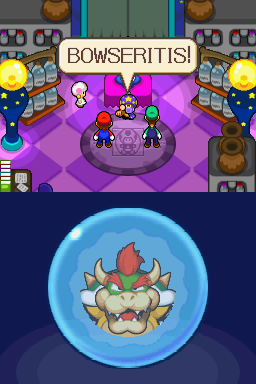 Unlike Mario & Luigi: Superstar Saga and Mario & Luigi: Partners in Time, it appears that enemy stats did not change for the U.S. version of Bowser's Inside Story. Bosses are listed in order of appearance. 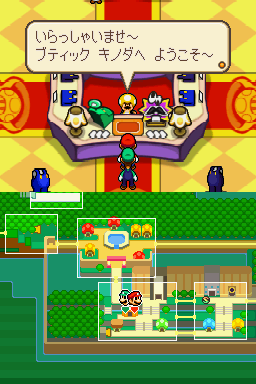 All "Gera-" prefixes and "-kowitz" suffixes attached to enemy names come from "Gerakowitz," Fawful's Japanese name. Broggy: The block-doggy's Japanese name "Burodoggu" is a combination of burokku (block) and doggu (dog). Pendril: "Doripen" is a combination of doriru (drill) and pengin (penguin). 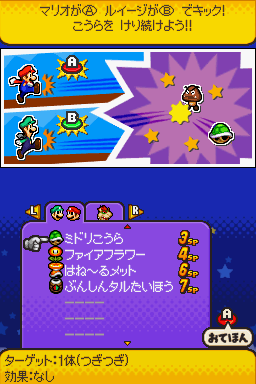 Piranha Plorp: "Dokkun Plant" is a play on doku (poison) and Pakkun Flower (Piranha Plant's Japanese name). 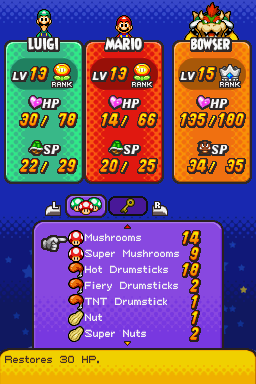 Protobatter: It's possible that "Tanpa-kun" is a play on tanpaku (protein). Pwallop: "Porippū" is a play on porīpu (polyp). Sneed: "Taneyan" comes from tane (seed). Stonk: "Nioinii" is derived from nioi (stench). Wiggler: The hana in "Hana-chan" means flower, referring to the flower on its head. Blitty: Similar to "Blitty" being a combination of "block" and "kitty," its Japanese name "Burokyatto" is a combination of burokku (block) and kyatto (cat). Stingler: The biribiri in "Biribirinpa" refers to an electric shock.